The digital age is here, with physical media dying a slow death. 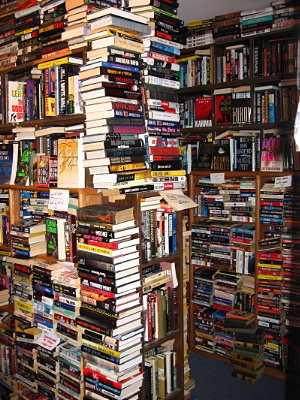 I’m an avid reader, so my office was crammed with 33 bookshelves holding over 1,000 books. But since I bought my first Kindle in June 2008 and replaced it with the Kindle 2 a year ago, I’ve only bought a few physical books. The electronic ones are so much more convenient, especially since I can also read them on my iPhone in a pinch. I look forward to experimenting with reading on an iPad in a few months. So I decided to use Digital Age Downsizing to help pay for that expensive new toy. I culled 190 books for disposal. I mainly wanted to get rid of them with minimal effort on my part and make a little money at the same time. So eBay or its half.com or selling books on Amazon was out – I didn’t want to trouble with listing each book, tracking sales, and finding oodles of boxes and tape to ship them out piecemeal. Instead I tried out a few online services and settled on Powell’s Books. I loved visiting their enormous bookstore in Portland, Oregon a few years back, and they made getting rid of my books very easy. I just had to type in the ISBN numbers above the barcode on the back of each book and Powell’s told me which ones they would take and how much they would pay. I split my selling up into three shipments so that I could pack about 25 books in each box, print out the free Media Mail shipping label Powell’s provided for it, and haul the boxes to the post office. Powell’s will pay me $180 for 66 of the 190 books I offered to them. As for the remaining 124, I put a few into other online buyers and got few offers, so I plan to pack them up and donate them to my local public library. They will route them to book selectors for review and the accepted ones go on the shelves and the others go to the local Friends of the Library for sale in their bookstore. So I’m partway to paying for that iPad. What next? I went through my closets and gathered up a bunch of old electronics: a bunch of old telephones, two answering machines, a clock radio, and a cheap MP3 player. I tried using Gazelle.com to sell them, but the service wouldn’t complete my registration. So I tried some other services. Unfortunately, old electronics are not worth much, if anything. I did manage to sell an old GPS unit to MyBoneYard.com and sent that off, but I took the rest of the stuff to Goodwill. The next big prospect is the collection of 450 CDs in my living room. I haven’t touched them since I ripped them into MP3 format years back. Looks like SecondSpin.com will take them off my hands for anywhere from 10 cents to $10 each depending on demand, with an average of perhaps a dollar or two a disc. I’ll first want to re-rip a bunch of them in a higher-quality bitrate. Back when I ripped my collection the software I was using could only do 128 kbps, but now I can have iTunes re-import them into the 256 kbps variable-bit-rate MP3 format I now prefer. Then I can price them out, put about 25 in each box so that the shipping cost is properly covered, and sell ’em off. And soon I may have much of that iPad paid for and far less clutter around the house. I love the Digital Age.